(1.) the huge TERMINI sign at both ends of the station and having to decide which side I should come out from since it would be a really long walk if I made the wrong decision. (2.) The familiar Tagalog conversation I heard immediately from group of Pinoys around me. The last time, I had my hostel address printed out and asked direction from a group of Pinoys. I don’t know why I didn’t have it this time, since I would definitely need it, but this long term traveling made me lazy and impractical. It’s getting harder and harder to pretend to be organized. hehe. This also happened to me in Wroclaw where I arrived in the train station and I couldn’t even remember the name of my hostel. This time I know the name but don’t know the address. I always think that I will find a wifi hotspot and then use my iPhone to find the email confirmation. But Starbucks and McDonalds aren’t as reliable as they used to be. I was in Rome for one day in 2007. It was supposed to be a 6-week Europe trip but was cut short because my father was very sick and I had to go home on the 5th week. He’s recovered and is fine now. The last week was supposed to be Florence and Rome, which I both skipped, sort of. My homebound ticket was from Rome so I had to be here to take my flight. What happened in Rome 4 years ago? I’ve never formally published this story but have told it many times to people. 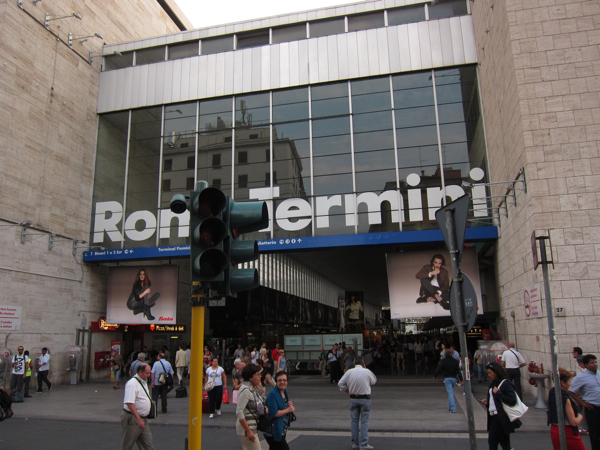 I arrived Roma Termini at mid morning from Nice and headed directly to my hostel. It was my first time ever to be in a hostel and was a bit confused with all the things that were going on in a typical busy hostel. I sat and waited for my turn. I was told that check-in is at 2 p.m. but I can leave my bag if I want to go around the city. I was asked the standard traveler FAQ’s where you been, where you’re going, how long are you staying, which I was not accustomed to at that time. So I was very enthusiastic to tell my story and the reason I’m only staying for a day in Rome. Then this guy in the hostel, Mario, a typical friendly Italian guy marked a few things I can see in Rome and then offered that if I wait a little bit, he could take me on his Vespa so I can cover more in one day. Vespa in Rome, why not? We hopped on his Vespa. I had my camera on video as we cruised along Piazza Venezia. He was doing voice over for my video. It was a nice tour, all 30 seconds of it. And then a car hit us. I remember I opened my eyes and saw the white sky. I saw police talking on radio. I was disoriented but somehow figured he was speaking in Italian. I also heard the word Roma. I remember thinking, Rome? in Europe? My Europe trip pushed through? I swear it was like in a movie. “Hey, are you ok?” English. I assumed it was me he’s speaking to, so I looked, and the face didn’t register as anyone I know but strangely familiar. “Who are you? I don’t remember you.” I replied bluntly because I was wracking my brain to remember. “HOSTEL? I don’t stay in hostels!” I screamed in my head but didn’t say anything. I stared back at the sky trying to remember. There was an ambulance and some medic asked if I can stand and helped me up. I was fine, a huge bruise on my left leg. Nothing broken. But I was still brought to the hospital in an ambulance with Mario, who had a neck brace, for check up and to answer some police questions. Not as dramatic as in the movie, everything came back to me. I remembered my flight to Paris weeks ago. I remembered RB at the airport. I remembered having to go home the next day. The doctor and the police were done with me but Mario was still in the hospital somewhere. I didn’t have to pay for anything because his insurance covered me as his passenger. I waited but I don’t know what I was waiting for. I saw Mario speaking with someone on the phone earlier and he lives in Rome so I’m sure someone will take care of him. Finally I got my map out and asked the police where I was and decided to head out. I passed by the Trevi Fountain and as I reached in my bag for the camera, I remembered I was shooting a video. Finally I found my hostel after going to an Internet café. I called up Mario for a meet up. It was a very isolated event of my life. It could’ve been a really bad accident. I could’ve really developed amnesia. Mario is the only testament of this incident so I thought I should come and say hi, once at least. So I came to his bar, we drank, relived the accident, and updates. It’s how I spent first night back in Rome. As said above, it definitely is one for the book, amazing serendipity! I was there also once for a 3day stop-over, on my way back to Manila. I toured the ruins alone and i had a most unusual experience too, not only deja vu but a pastlife flashback, and i got healing. That short visit also showed me 3 motor vehicles a day, and its scary. I just had FAO as my base so just walked to the ruins. It’s crazy you had the video camera rolling right when the accident occurred. Rome is one of my favorite cities, but I’m not sure I would feel comfortable driving in the city. It is very chaotic, but accidents can happen anywhere. I’m glad you were ok and able to make an Italian friend out of the traumatic experience. Oh my! Thank goodness you’re okay. I had goosebumps while watching the video. I guess one of the countries I really want to visit one day is Rome. I’m looking forward about the people, culture, sceneries, food (most especially) and the very experience itself. Your experience at Rome was such an unforgettable moment, wasn’t it? The recollection really sounds like a movie to me. Nice post! Thanks June! It was pretty unforgettable and now confirmed that it actually happened. It’s an amazing city Rome. I don’t even know how to begin my post.